In recent years, our society has become more concerned about the food we eat, the medications we take and give to our pets and children, and what we are exposed to in the environment. There has been some mistrust of traditional medicine and people have looked for other ways to treat both their ailments and their family’s ailments. Many of these treatments fall into the category of alternative medicine. I believe there is a place in human and veterinary medicine for both traditional and alternative medicine; in some cases a combination may be best for a pet. 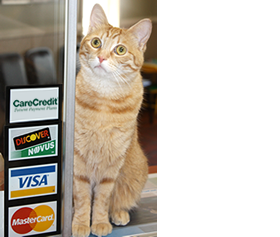 As a veterinarian, my goal is to recommend what is best for a pet. I do not want to put an animal on a medication that may harm it or perform a surgery that may put it through unnecessary stress and pain. I always try to recommend the best treatment and then offer alternatives. For example, the best treatment for an older pet with arthritis may be an anti-inflammatory medication. However, a particular animal may be sensitive to the medication and develop stomach upset or an increase in liver values. I might first offer a joint supplement and a joint therapy diet as an alternative therapy for the arthritis, and use the anti-inflammatory pills only as needed. Fonzie, looking cool in shades which protect his eyes, undergoes laser treatment . A recent addition to my practice gives pet owners another option to help treat their pets’ ailments. I now offer laser therapy for pets. Laser therapy has been used in human medicine for making precise surgical incisions, for treating dermatological conditions, for treating certain cancerous conditions, and for helping perform various other surgical procedures. Laser therapy is light that is emitted at a certain wavelength in a concentrated beam. The laser therapy offered in my practice is from a lower intensity laser used in physical therapy in human medicine. It can be used for a number of conditions in veterinary medicine. Laser therapy works by stimulating the metabolism and improving the health of the body’s cells. Stimulating the cells metabolism helps to promote healing, decrease pain, decrease inflammation, improve circulation, reduce scar tissue, improve nerve function, and stimulate acupuncture points. 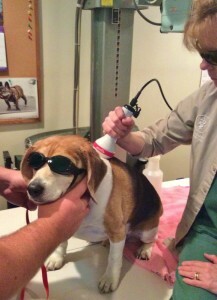 The only risk laser therapy poses is if the pet looks directly into the beam of light. To prevent this, both the person administering the laser and the pet receiving the treatment wear protective eyewear. This mode of therapy is a noninvasive treatment for various conditions. With every surgery that is performed at my clinic, including routine spays and neuters, the treated animals will now receive complimentary laser therapy treatment of the surgical incision prior to going home. Other conditions that may benefit from this treatment include hot spots, ear infections, skin infections, wounds, cuts, abscesses, allergic skin conditions, burns, ACL tears, hip dysplasia, back and neck pain, osteoarthritis, and paralysis. The practice is offering a package deal for older animals that are having issues with arthritis. The recommendation is for a pet to receive laser therapy every other day for six treatments followed by maintenance treatments based on the severity of the condition. I have seen major improvements in some of my patients undergoing this therapy. Two different dogs that were brought in for neck pain were almost back to normal the next day after a laser treatment. One little dog that received laser therapy on post ACL repair and knee cap surgery is healing very quickly and ahead of the normal expected schedule. Another elderly female dog with long term hip dysplasia and osteoarthritis is now able to get up and down from a lying position with much less effort. I have already seen some major improvements in many pet’s conditions. Call the clinic at 366-7440 for more information about laser therapy. It is a simple, inexpensive form of therapy that has major benefits for a pet!